JoyBits Ltd. is ringing in Halloween a little early by releasing their game app, Ghost Bastards AR. If you’ve ever harbored a secret desire to hunt down and exterminate ghosts, now’s your chance! Using the iPhone’s camera, Ghost Bastards AR brings you that experience with the added special effect of using real-life surroundings. If you turn on the Use Camera setting under Options, the iPhone becomes a conduit through which you can see spectral beings (if you’re on an iPod Touch, which has no camera, you can still play by using the preset scenery in Background Mode). Tilting the device left, right, up, and down will move the view of the scene accordingly. You’re looking for ghosts to bust, and small arrows will appear along the edges of the screen to help you find them. The ghosts will fly at you and try to throw their webs at you; if that happens, you lose a life, which you will need on harder levels! To get rid of the ghost, just tap them with your finger. They will burst into bubbles and disappear, but you have to catch them first. You begin as a Newbie hunter and can make your way to Divine Warrior ranks, if you manage to survive that long. There are two modes: Adventure, which has different levels to go through, and Survival, which is an all-out barrage of ghosts to contend with. Even with such simple gameplay, Ghost Bastards AR manages to bring something new and clever to the table. Integrating the iPhone’s viewfinder capabilities and the concept of being able to see the beyond is an fantastic idea, and JoyBits Ltd. carries it out rather admirably. Sure, it takes some really odd contortionist moves to play, but it’s honestly fun and fresh. Ghostbusting has never been so easy. 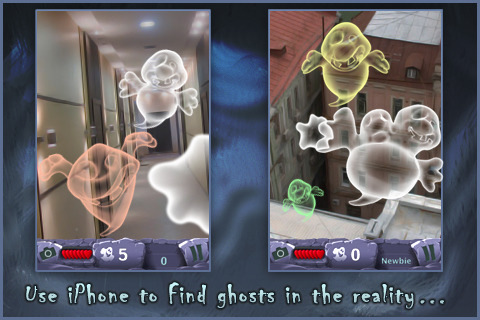 AppSafari review of Ghost Bastards AR was written by Julie Guan on June 24th, 2010 and categorized under Action, App Store, First Person Shooter, Fun, Games, Physics Based. Page viewed 4856 times, 3 so far today. Need help on using these apps? Please read the Help Page.